Chi Ro tapestry shows the artwork of the Book of Kells (AD 800). The characters, Chi and rho are the first two letters in the Greek word for "Christ". 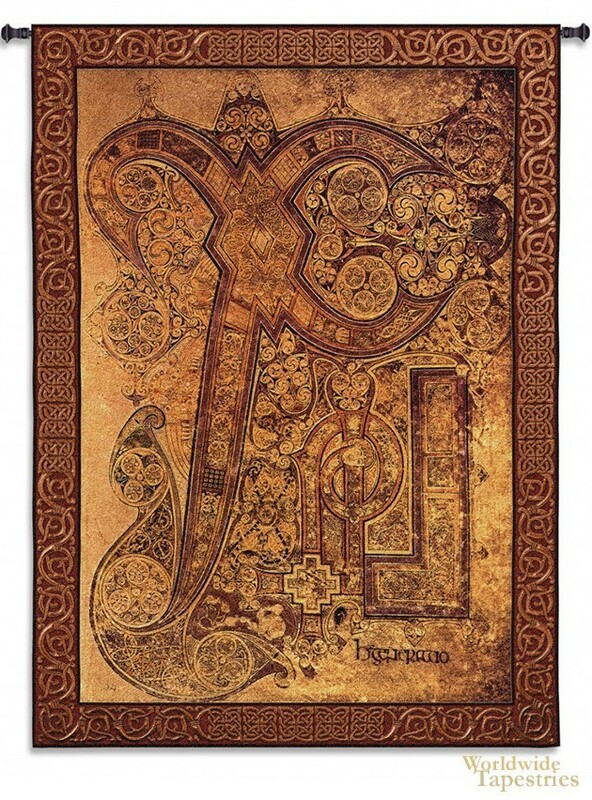 The Book of Kells of the Book of Columba is a manuscript of the four gospels of the new testament in Latin. It was created by the Celtic monks at around the year 800 AD. The illustrations in this book are extraordinary and exquisitely detailed. This specific work is from folio 34r. The original was used in the alter for readings. This religious art tapestry "Chi Ro" is lined and has a tunnel for easy hanging. Note: tapestry rods and tassels, where pictured, are not included in the price. Dimensions: W 51" x H 72"